Summer may be coming to an end, but the Lake Forest Park Farmers Market is still going strong through the middle of October. Each Sunday you can count on finding a delectable selection of freshly grown fruits and vegetables from over a dozen small, family farms around the state. If meat and cheese are on the menu, stop by Hidden River Farm, Molly Bear Farm, Samish Bay Cheese, or Wilson Fish Market. Or if you’re having pasta, head for La Pasta to get all sorts of homemade pastas from spinach pappardelle to smoked salmon ravioli. Fill out your meals with great bread from Proven Bread and other delicious baked treats from Doll House Baked Goods. Add some zing to your dishes with a stop by Stovepipe Sauce Company, Firefly, or Serendipity, or add a dollop of sweet surrender with something from The Beekeepers Secret or Blue Cottage Jams. And don’t forget to pick up some gorgeous flowers to help set the perfect table. For a foolproof finishing touch, get some crave-worthy coffee from Middle Fork Roasters, terrific tea from Shen Zen tea, wonderful wine from the Lopez Island or Lupine Vineyards, or hearty hard cider from Core Hero Cider or Greenwood Cider. If you get peckish while you’re shopping, get a tasty hot meal from Patty Pan, Vespucci Pizza, or Drummin’ Up Wontons or a yummy treat from Classic Kettle Corn, Seattle Pops, Pete’s Perfect Toffee, or JonBoy Caramels. 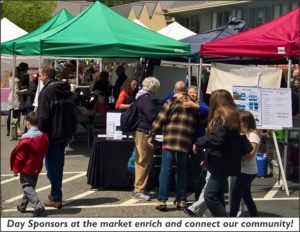 The LFP Farmers Market is a fabulous place to connect with your community and Day Sponsors are an important part of that community. This week, the market is pleased to welcome the League of Women Voters of Seattle-King County as the day sponsors, so be sure to stop by their table to learn about their efforts and how you can get involved. 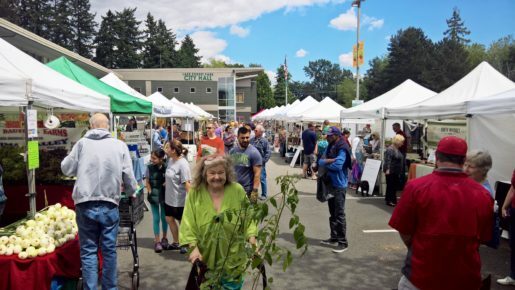 And by the way, there are still Day Sponsorship openings in September and October if your business or nonprofit organization is interested in being a part of the LFP Farmers Market. The LFP Farmers Market welcomes SNAP benefits, WIC & Senior Vouchers, and their own locally funded Market Bucks, which are distributed through a variety of community partners including Hopelink, YMCA, the SLFP Senior Center, and local area schools. The market is also proud to participate in the Fresh Bucks matching program that helps SNAP recipients access fresh, healthy fruits and vegetables at the market. In coming weeks, watch for fun special occasions like Busker Day at the Market, the return of the Heart of Dreams Alpacas, and a Closing Day Party on October 15th. The LFP Farmers Market, presented by Third Place Commons, is open from 10am to 3pm every Sunday through October 15th (plus bonus markets – see below). 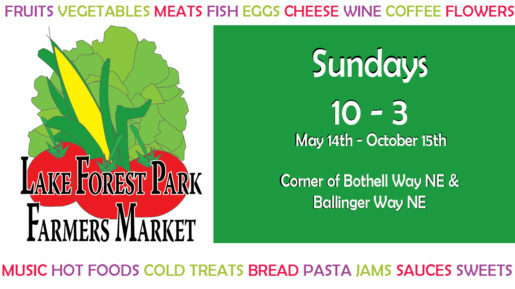 It takes place in the parking lot of LFP Town Center adjacent to City Hall at the intersection of Bothell Way NE and Ballinger Way NE. BONUS MARKETS – SAVE THE DATES! Mark your calendars now for our special fall bonus markets on Nov. 5th, Nov. 19th, and Dec. 10th. And don’t miss the return of the holiday crafts fairs that will happen in conjunction with the Nov. 19th and Dec. 10th markets. (Crafters, please keep an eye on our website and Facebook for the applications, which will be posted later this month.) See you at the market! Next Post: Attention Commons Creatives - Artists, Crafters, & Writers Wanted!